South Korean and Vietnamese officials pose during a signing ceremony for a wind farm project on Thursday. From left: Tran Tuan Ahn, Vietnam’s industry and trade minister; Duong Quang Thanh, chairman of Electricity of Vietnam; Park Gee-won, chairman of Doosan Heavy Industries & Construction; Yoo Hyang-yeol, president of Korea South-East Power, and Paik Un-gyu, Korea’s trade, industry, and energy minister. South Korea’s Doosan Heavy Industries & Construction Co. said on Friday that it has signed an agreement with Electricity of Vietnam Group for an offshore wind farm project, marking the first time for the country’s largest power plant equipment maker to make a foray into overseas offshore wind power generation market. Under the initial agreement that was signed by the company’s chairman Park Gee-won on Thursday, Doosan Heavy Industries & Construction will supply wind power equipment including energy storage systems in the form of engineering, procurement, and construction for a 3-megawatt capacity wind farm in the Southeast Asian country. 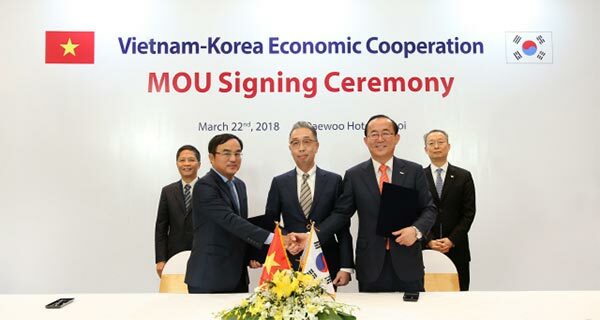 Doosan Heavy Industries & Construction will also be in charge of operations and maintenance with Korea South-East Power Co. while Electricity of Vietnam will be responsible for securing the test site and providing support to gain project-related licenses and approval. The agreement was made in Vietnam as Chairman Park is in the Southeast Asian country as part of a business delegation member accompanying President Moon Jae-in who is on a three-day state visit to Hanoi. Doosan Heavy Industries & Construction also signed an agreement with Vietnam’s Construction Corporation No. 1 for a wind power development project. Doosan Heavy Industries & Construction is hoping to supply major equipment to CC1 for two projects to build a wind power complex in Binh Thuan in southern Vietnam and be in charge of operations and maintenance. CC1 has obtained business licenses for wind power projects totaling 105 megawatt in capacity. Vietnam stands out among its Southeast Asian peers in the transition to clean fuel sourcing. The Vietnamese government plans to up its wind power capacity from the current 180 megawatt to 6,000 megawatt by 2030. Doosan Heavy Industries & Construction has also been expanding its wind power business in recent years. In 2011, it developed a 3 megawatt level wind power plant model and it is also expected to commercialize a 5.5 megawatt offshore wind power technology. In September, last year, the company also built the country’s largest offshore wind farm in Tamra off the western coast of Jeju Island. Doosan Heavy Industries & Construction, meanwhile, will also be joining a project in Vietnam to localize thermal power generation, under a business agreement signed by Paik Un-gyu, Korea’s minister for trade, industry and energy and his counterpart Tran Tuan Ahn, Vietnam’s minister of industry and trade, on Thursday. The Korean company will create a working-level group for the project within three months period and carry out arrangements with Vietnamese partners.